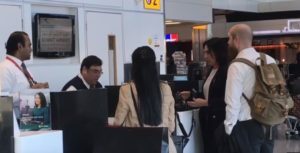 Kuwait Airways has agreed to pay substantial damages plus costs to an Israeli National who was refused a ticket on a Kuwait Airways flight from London to Bangkok on the grounds of her nationality. Mandy Blumenthal, with the help of UK Lawyers for Israel, issued a claim against Kuwait Airways, claiming damages for racial discrimination and harassment, after she tried to buy a return ticket to Bangkok at Heathrow Airport from the Kuwait Airways desk last November. UK Lawyers for Israel, a voluntary organisation of lawyers who support Israel, facilitated Ms Blumenthal’s claim by organising her legal representation by barristers John Bowers QC and Benjamin Gray, and David Berens of Fuglers Solicitors. Ms Blumenthal’s encounter at the Kuwait Airways desk was filmed, and the video is available on Youtube. At first Kuwait Airways were prepared to sell her the ticket but refused once they saw her Israeli passport. The Kuwait Airways ticket clerk repeatedly explained: “Israeli passport holders are not permitted to travel on Kuwait Airways”. Kuwait Airways has now agreed to pay Ms Blumenthal damages but has not admitted liability. However, it is likely that other Israelis will come forward with similar claims. Jonathan Turner, Chief Executive of UK Lawyers for Israel, confirmed that the organisation would be willing to assist other claimants. Kuwait Airways’ policy of discrimination against Israeli nationals was also shocking to staff at Heathrow Airport. The airport supervisor, filmed in the video, was clearly shocked and thought that Mandy must be mistaken. She did not believe that someone could be refused a ticket because she is Israeli. There have been several other complaints against Kuwait Airways elsewhere in the world. In 2015, following a complaint by The Lawfare Project – a legal think tank and litigation fund that supports cases against anti-Semitic discrimination around the world – the US Department of Transportation ordered Kuwait Airways to allow Israelis on its flights from the US to London or risk termination of its US operations. Kuwait Airways responded by cancelling all of its flights from New York to London. After The Lawfare Project started another legal action against Kuwait Airways in Geneva, it halted all its intra-European routes. A third claim by The Lawfare Project in Germany in respect of flights from Frankfurt to Bangkok via Kuwait was rejected by a Frankfurt court last year, triggering controversy. The Lawfare Project has appealed, with an appeal hearing scheduled to take place in Frankfurt in September.